Anktangle: Today is National Coming Out Day! Today is National Coming Out Day! 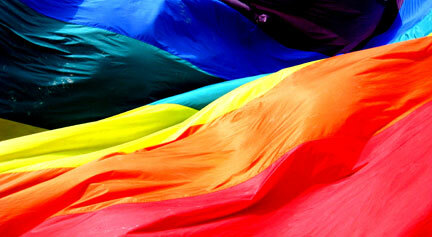 This is a day I enjoy each year, a day of awareness and discussion within the LGBTQ community and for straight allies. Our world is a fabulously diverse place. Let's celebrate each other—the sameness and the differences—instead of spreading hate and fear through homophobia. "I want my girls to know that our home is a safe place for them and that they will always be accepted and loved here. I want them to know they can always call mom and dad and tell us anything. That we will listen and understand and try to help. That we, if no one else, will stand up for them." So, what can you do to show your support today? Talk to your kids about acceptance and being tolerant of differences. Show them what it means to celebrate diversity! Sing them this lullaby. Let them know you love them always and forever, no matter what. Then do your best! Join me in wearing purple on October 20th to remember the six young gay men who committed suicide in recent weeks as a result of homophobic abuse in their homes and schools. No one should be made to feel the way these men were, simply for being themselves. Everyone deserves to be happy. Encourage others not to take that away from them by inflicting hate and spreading ignorance. Check out the Human Rights Campaign, an awesome organization that works for equal rights for all. Sign up for their newsletter or become a member. Use their site to become more active in working towards equality. (Sign the open letter to Mormon Church leader Boyd Packer, who is preaching intolerance even in light of the recent suicides.) Use their Facebook Application to donate your status to HRC for the day. Finally, hug the ones you love, and be grateful for the people in your life who love and accept you for who you are. I know I am! I really liked that lullaby! Someone commented on my Facebook link to my post earlier that "Jesus said to love the person and hate the sin." But I think what is wrong with applying that statement to this issue can be summed up by your words, "everyone deserves to be happy." Kind of hard to love someone while hating a big part of who they are, expecting them to be someone they're not, and not caring whether or not they are happy. Thank you both for the reminder! Jenny, that "hate the sin & love the sinner" thing has bugged me, too, for the same reason. It's like telling someone you hate that they're [insert important identity aspect here: a woman, Latino, an artist, etc] that they couldn't/wouldn't want to change but then saying, "But I love you." I'm trying to figure out ways to talk about differences like homosexuality with my son in a natural and respectful way, so that he'll know what variety is out there and will feel supported in whatever path his love life ends up taking.